Like the XF sedan, the F-Pace is getting a turbodiesel—but you'll have to wait a few months after it goes on sale, before you can buy one. Even with other Range Rovers and Discover models sitting across the showroom, there's plenty of room for more vehicles in the broad spectrum that grabs everything from the Buick Encore to the Benz G-Class. And if a sort of automotive purity test is invoked, well, Porsche's proven that no brand can really thrive in the U.S. without some kind of crossover SUV in its lineup. Pretty, Mazda-like styling makes the F-Pace a standout, but its interior is more subdued. The handsome shape fits neatly alongside the XF and XE sedans. 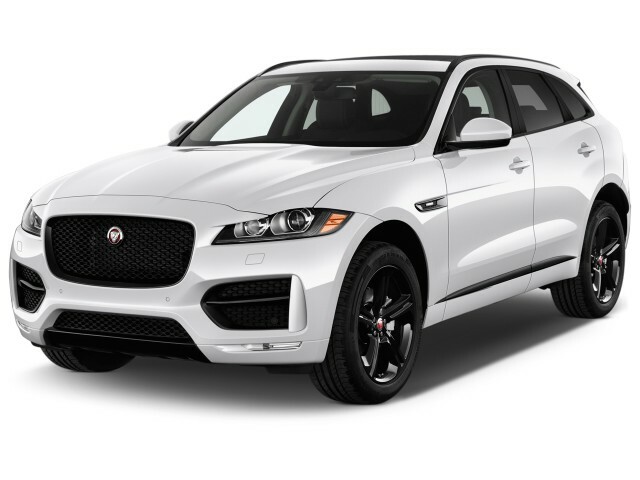 With a tall grille and available LED lighting, the F-Pace matches deft details with a traditional form in one distinctive, beautifully outlined crossover-SUV body. Inside, the theme's less showy, more standard-issue. The F-Pace has a spare but elegant cockpit, one where touchscreens and digital displays factor in conspicuously. A rotary drive controller rises from the center console, surrounded by swaths of piano-black trim, with aluminum and wood framing the cabin. The F-Pace has the excellent road manners it needs to tackle rivals like the Porsche Macan. A supercharged V-6 with great low-end grunt and lots of resonance inside the cabin powers the mainstream models. 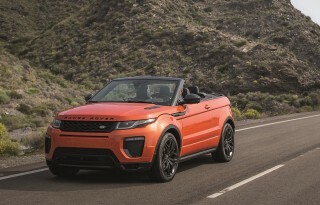 It's teamed with a crisp-shifting 8-speed automatic, and can hit 60 mph in 5.1 seconds, according to Jaguar. The new turbodiesel inline-4 is a great companion to the F-Pace's moderate off-road ability. The EPA has rated the gas-powered F-Pace at 18 mpg city, 23 highway, 20 combined; the diesel earns a heady 26/33/29 mpg rating. All-wheel drive is standard here, and it can vary power equally between front and rear wheels, or send it all to the rear. It works with a programmable driving-mode system that tailors throttle, shifts, and traction-control settings based on the driving surfaces. The F-Pace's 8.4 inches of ground clearance has some clear Land Rover roots, but its ride and handling get the priority lane. With an independent suspension and electric power steering, the F-Pace has brilliant road manners on par with the Macan. Even though it's working with 4,000 pounds of curb weight, it rarely feels heavy or dull—but it does feel more at ease on the mid-line 20-inch wheels and tires versus the available 22s. Spacious and subtly well-trimmed, the Jaguar F-Pace nails the utility part of the SUV equation. 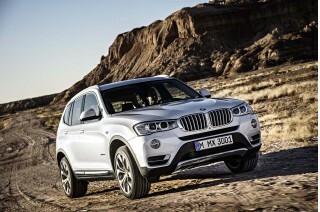 There's good space for five adults inside, and a high driving position that nets good outward vision for the driver. The F-Pace's seats are firm and could use more bolstering, but head room isn't a concern even though the roofline tapers toward the rear. The back seat has enough knee and shoulder room for two adults, and the seats recline for long-distance comfort. The second-row seats are split 40/20/40 and fold down to boost cargo space from 33.5 cubic feet to 61.4 cubic feet. No crash-test data has been published to date, but the F-Pace can be fitted with sensors, cameras, even lasers that prevent accidents. The F-Pace has lush trim, widescreen infotainment, and the best service and warranty in its niche. Prices start from $43,385, and rise quickly into the mid-$60,000s with some of the keen options. Standard features include power windows, locks, and mirrors; cruise control; and Bluetooth and USB connectivity. All versions get Jaguar EliteCare, a 5-year/60,000-mile limited warranty with free roadside assistance and maintenance for its term, an excellent added value. Major upgrades to the features include a panoramic sunroof; leather; megawatt audio; navigation; and 20- or 22-inch wheels. On the infotainment front, the F-Pace gets an AM/FM/XM audio system governed by Jaguar InControl Touch and an 8.0-inch touchscreen. A more capable InControl Touch Pro is optional; it gets a 10.2-inch touchscreen and standard navigation, as well as an 825-watt Meridian sound system. Pretty, Mazda-like styling makes the F-Pace a standout, but its interior is more subdued. The F-Pace blurs the lines between crisply-drawn Land Rover SUVs and softer, sleeker Jaguar sedans, and it does so beautifully. From the side, it's state-of-the-art crossover, but the details give it a sharp sense of identity, and a place between the Jaguar XE and XF sedans. At the front, its tall mesh grille and signature LED lighting resemble the same looks from those four-door cousins, just arranged on a taller plane. The F-Pace's side windows are steeply tapered, and the front fenders are slit by long vents. A half-circle taillight echoes the same shapes on the compact XE and the F-Type sports car. From the inside, the F-Pace lacks the drama of a Benz GLC, but it's a functionally fine and well-suited space. The spare, tailored look is composed of panels of piano black trim, thin rings of metallic trim, and on some models, wood and ambient lighting to frame out the cabin. What's gone missing is the sense of flair and glitz that marked Jaguar's cars from the 2009 XF through the most recent XJ. Remember "heartbeat" lighting? The F-Pace is more discreet than that. The cockpit can come off stark and dark—lighter color choices look better, and wood does, too. The available houndstooth metal trim doesn’t read as well as the real grain or the stock piano-black plastic. Touchscreens and digital displays factor in conspicuously. There's an 8.0-inch interface on base versions with a streamlined infotainment interface. A more capable system brings a 10-inch center screen with gesture control, and a 12.3-inch screen that replaces the twin-dial gauges with an adaptive display that can switch from "dials" to a full-screen navigation display. The F-Pace has the excellent road manners it needs to tackle rivals like the Porsche Macan. Jaguar's parent company already sells plenty of SUVs under its other imprint—maybe you've heard of it, Land Rover?—so the F-Pace has both an overlapping SUV mission and the permission to strike out in a far more performance-oriented direction. Power for the F-Pace comes from a supercharged 3.0-liter V-6. On most versions it makes 340 horsepower; on the F-Pace S, it's tuned for 380 hp, a 0-60 mph time of about five seconds, and a top speed of 155 miles per hour, according to Jaguar. In either trim, the supercharged V-6 makes no bones about its sporting intentions. It's quick, and the exhaust sounds want you to know it, and that can wear on passengers after a few hundred miles of driving. With the turbodiesel, the F-Pace is more relaxed and less vocal. Passing power isn’t overwhelming, but it's the obvious choice if you'll do any light off-roading in this luxury crossover; it'll idle at 800 rpm all day as the F-Pace works its way off pavement, even way off. An 8-speed automatic with a rotary shift control and, on S models, paddle shift controls, is standard on the F-Pace. It's a perfect companion to both powerplants, with a few ratios devoted to low-end grunt and a couple enabling smooth high-speed cruising. The F-Pace is the first Jaguar to offer standard all-wheel drive. It’s a new chain-driven system that lets power split from a heavy rear bias to a neutral split from the front to the rear wheels. The setup can constantly vary which wheels get power, based on acceleration and cornering forces. The F-Pace has up to 8.4 inches of ground clearance, and approach and departure angles of 25.5 degrees and 25.7 degrees, front and rear. It can wade through water up to 20.7 inches high. 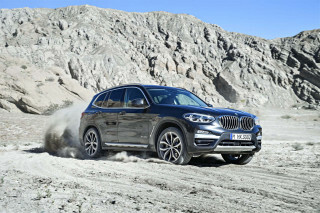 The SUV also gets a programmable driving-mode system that lets the driver tailor throttle delivery, shift timing, and traction-control settings based on the driving surfaces. Select snow/ice, wet pavement/gravel, or a deep-snow mode, and the F-Pace adjusts its power delivery accordingly. On our first drive in the Balkan country of Montenegro, the F-Pace moved assertively over old Prussian roads cut into stony ground. Its electronics handled hillclimbs and descents flawlessly, with the turbodiesels getting the easy nod for extreme low-end smoothness. It can go decent distances into the deep, but the F-Pace is no Land Rover. It's set up to be a practical Jaguar, which means ride and handling take priority over rock climbing and mud-running. The F-Pace's hardware is based on the stuff that underpins the XF and XE sedans, with some reworking to accommodate its wagon body and higher weight. Most of the mass in its front control arms and rear independent suspension comes from aluminum pieces, for less weight and more responsive handling. Monotube dampers are standard, but the F-Pace also offers adaptive air dampers as an option. Steering is variable-ratio, driven by electric motors, tunable in the F-Pace's driving modes. The brakes can simulate torque vectoring by clamping on an inside wheel to tighten the cornering line. All told, the road-biased handling gives Jaguar an SUV that's on par with Porsche's Macan. 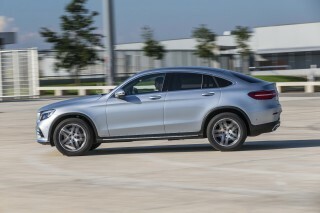 Its linear, progressive steering and tightly controlled body motions have a Germanic flair. Its stiff body and firm suspension mean the tires work hard to keep its 4,000 pounds of curb weight in place, but it rarely feels overly heavy or dull. One note: we'd opt into the mid-range 20-inch wheels and tires. With them, the F-Pace is more absorbent, and steering feel is just plain better. There’s not as much wheel mass to overcome, and finer inputs are easier to execute—while the optional 22-inch tires give great grip, at a noticeable cost to ride quality. 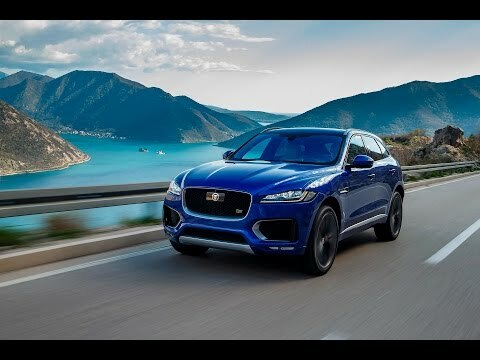 Spacious and subtly well-trimmed, the Jaguar F-Pace nails the utility part of the SUV equation. Excellent road manners are something we expect from a Jaguar. For its first SUV, those expectations rise and get more complex, as we add practicality and flexibility to the must-have list. The F-Pace is midway between the XE and XF sedans in size, and can seat five passengers. It's roughly the same dimensions as an Audi Q5 or a Porsche Macan. It rides on a 113.1-inch wheelbase, is 186.3 inches long, and sits 65.6 inches high. Interior space is fine, with an inch to spare at least in all directions, with tall drivers leaving room for tall passengers in back. Jaguar’s plushly padded past is long gone: The F-Pace has very firm and flat seats, with just a bit of lumbar adjustment, and a high driving position for the commanding view of the road that draws drivers to SUVs in the first place. F-Pace drivers will have to contend with some fiddly ergonomic choices. The window switches sit high on the door caps, while the lock button is mounted low. They're placed in the opposite locations you'd expect, in relation to each other. The strip of switches for driving modes is impossible to find and flick without taking your eyes from the road. Other ancillary controls make up twin rows of black buttons on the dash, buttons that aren't so easy to locate on the go. There's enough room for full-sized adults back there, and yet the cabin can seem more confining than it is, mostly because of the plainly styled door panels, their height, and the abundance of dark trim. There's no sloping roofline like an X4 or GLC Coupe, so head room is fine, and the rear seats have power recline controls for relaxed cruising. The second-row seats are split 40/20/40 to boost the amount of useful storage. When the back seats are in use, the F-Pace has 33.5 cubic feet of cargo space; when they're folded flat, that space increases to 61.4 cubic feet. The power tailgate opens with the wave of a foot, and there’s a reversible cargo panel in case you’re bringing home something very dirty. No crash-test data exists; the F-Pace can be fitted with sensors, cameras, even lasers that prevent accidents. The F-Pace doesn't lack for standard or optional safety gear. 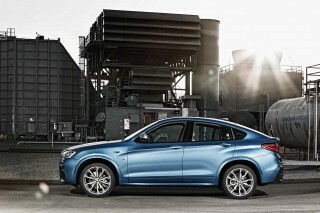 Stability control, all-wheel drive, and a full suite of airbags are included. The F-Pace also comes with a low-speed traction-control system that balances braking and throttle to launch it more smoothly on ice or slippery surfaces. One annoying detail: the base F-Pace doesn't come with a standard rearview camera, but it is offered as a $400 option. The F-Pace also comes with a forward-collision warning system with automatic emergency braking, made possible by a set of stereo cameras set behind the windshield. 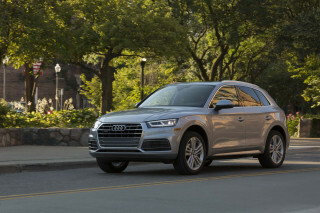 The options list includes adaptive cruise control with stop-and-go control, which means the SUV can follow traffic at low speeds with minimal driver intervention; lane-keeping and lane-departure warning systems; a laser-projected head-up display; blind-spot monitors with cross-traffic alerts; and automatic parking assistance. We'll update this section when crash-test data becomes available. It adds up to a right-on-target luxury SUV, but how does the F-Pace do in...stuff? The 2017 F-Pace is priced from $43,385 including destination; the F-Pace S is priced from $57,695. 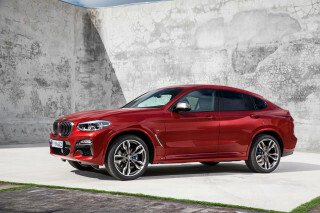 It's offered in five versions: base, Premium, Prestige, R-Sport, and S.
On all versions of the new SUV, you'll find the supercharged V-6 or turbodiesel inline-4, an 8-speed automatic, and all-wheel drive. 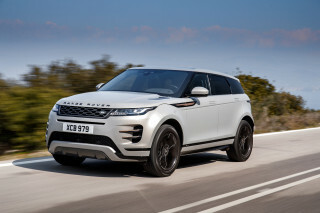 Standard features also include power windows, locks, and mirrors; cruise control; Bluetooth and USB connectivity; 18-inch wheels; a 380-watt Meridian sound system; a panoramic roof; and an AM/FM/XM/HD audio system governed by Jaguar's InControl Touch infotainment interface. Base models come with a synthetic leather interior. Premium cars add 19-inch wheels; memory seating; a rearview camera; and a garage door opener. Prestige models add leather seats; heated front seats and steering wheel; navigation; ambient lighting; front and rear parking sensors; and keyless entry. R-Sport SUVs get 20-inch wheels; distinctive body cladding and trim; LED headlights; 14-way power front seats; satellite radio; and a safety package including blind-sport monitors, lane-keep assist, and forward-collision warnings with automatic emergency braking. To that, the F-Pace S gets the uprated engine; an adaptive suspension; adaptive traction and stability control; and red brake calipers. The standard flavor of InControl uses an 8.0-inch touchscreen to direct various entertainment, navigation, and smartphone functions. Voice commands and steering-wheel controls give it a wider range of input possibilities. Navigation itself is an option, with data stored on SD cards. A more capable system arrives in the form of InControl Touch Pro; it uses a 10.2-inch touchscreen with gesture control, paired with a 60 GB solid-state drive to add on pinch-and-zoom controls, full-screen navigation, and a customizable home screen. With available data services, the system can predict fuel levels needed to reach a destination, can find parking spaces, and can show a 360-degree view of the destination when the car approaches, for easier navigation. Like many widescreen infotainment systems, InControl Touch finally has the real estate it needs to display scads of information. In a test drive in remote Montenegro, the system wasn't quick enough to respond to some inputs, and that can be its own distraction, along with the multitude of data running across the screen. We'll reserve judgement on the system until we test it, soon, on our own turf. The Pro interface comes paired with a 17-speaker, 825-watt Meridian sound system, and has screens that capture data on vehicle acceleration and lateral grip. It has companion apps available for both Android and Apple operating systems—but doesn't yet offer true CarPlay or Android Auto connectivity. All versions include Jaguar EliteCare, a 5-year/60,000-mile limited warranty with free roadside assistance and maintenance for its term. It's an exceptional value that's meant to erase any doubts owners might have about buying or leasing a new Jaguar—and it's a better offer than all the F-Pace's rivals. Available as a gas or diesel, the F-Pace is fairly fuel efficient or very fuel efficient. The 2017 F-Pace is available in two powertrains, a supercharged V-6 that comes in two different power levels: 340 and 380 horsepower; and a 2.0-liter turbodiesel inline-4. That's in line with vehicles like the Porsche Macan GTS, rated at 17/23/19 mpg. 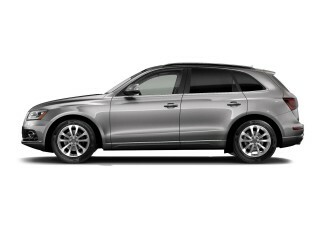 The Audi Q5 with the supercharged V-6 comes in higher, at 18/26/21 mpg. Despite the agita experienced by VW Group diesels and delays in EPA certification, Jaguar is selling a turbodiesel inline-4 version of the F-Pace now. The EPA rates that model at 26/33/29 mpg, which is a substantial improvement over its competitors. It is an excellent vehicle. Jaguar have out done themselves. Looking for a different year of the Jaguar F-Pace?